APR 17 Opening reception for the exhibitors Thursday, 5:00-8:00 p.m. 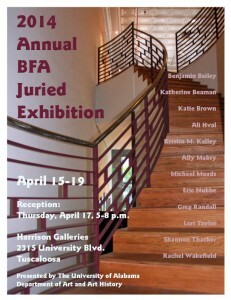 The UA Department of Art and Art History presents its 2014 Annual BFA Juried Exhibition at the Harrison Galleries in downtown Tuscaloosa for one week only, April 15-19. The public is cordially invited to a reception for the exhibitors on Thursday, April 17 from 5-8 p.m. Harrison Galleries is open 12-5 pm, Monday through Friday or by appointment. All UA undergraduate art majors who passed the review for the Bachelor of Fine Arts degree were eligible to enter the competition, juried by a committee comprised of UA studio faculty. Exhibitors in the juried show are Bachelor of Fine Arts majors Benjamin Bailey, Katherine Beaman, Katie Brown, Ali Hval, Kristin M. Kelley, Ally Mabry, Michael Meads, Eric Nubbe, Greg Randall, Lori Taylor, Shannon Thacker and Rachel Wakefield. For more information about the BFA degree and our other degree programs in the Department of Art and Art History, go to art.ua.edu/site/programs/ or contact the department at (205)348-5967.